Affordable housing with fair and transparent land-allocation measures is a challenge for many countries. The Sultanate of Oman solves this issue by means of land-allocation lotteries in which male and female citizens can participate in order to win a parcel of a new housing area. Besides supporting those in financial need the lottery aims to mix the separate tribes of Oman and thus contribute to the nation building of a modern society. In an earlier work, we showed that there must be severe doubts about the economic support aspect as it seems that the current lottery, without additional measures, fuels private land speculation, see Heim et al. (Homo Oecon 35:1–30, 2018). This article studies the emergent phenomenon of clan formation within the specific land-allocation system of Oman with a new mathematical and computational approach of agent-based modelling. This model is used to base the criticism to the system on scientific evidence. Both the method (clan formation exemplified as agent-based model) and findings (simulated agents and real-world behaviour) advance the discussion on how to mitigate some of the negative effects associated with the current land allocation system. To do so, we discuss the current state and criticism around this aspect of urbanisation in Oman. We study the spatial mixing of the tribes and the possibility of clan formation in modern Omani settlements in particular Muscat Capital Area. We see emergent phenomena arising from the agent-based model that matches real world behaviour leading to negative effects such as partial and incomplete land development, tribal clustering and real-estate market distortion. The agent-based model is used to discuss alternative scenarios under which tribal clan formation is used to generate a fairer and more complete settlement process in Oman to ensure the intended outcomes of Oman’s land-allocation lottery system. The rapid demographic development since the 1970s in Oman fuels a constant demand for housing. The particularities of this process are captured by Benkari (2017) who collects an overview of research and literature on urbanisation in Oman. The concentration of economic and political power in Muscat Capital Area further contributes to accelerated rates of urbanisation in this region of the Sultanate as studied by Nebel and von Richthofen (2016) in their four year research on ‘Urbanisation in Oman—trends and perspectives’. In a brief overview of the urbanisation process that lead to the emergence of Muscat Capital Area, we can see that the determining physical planning strategies were developed by Weidleplan (1991) and that these integrated the existing coastal oasis settlements and towns into a continuous urban fabric. Massive urbanisation of the northern coast of Oman led to deep structural transformation including the abandonment of traditional date farms, see Scholz (1982); Dutton (1999), yet the land property structure remained. This was of benefit for the wealthier farmers that now built houses for their clan in former oasis land, Abdelaal, (2013). With the advent of automobiles and an extended street-network by the 1980s, former rural areas were now accessible and connected forming a conglomeration of coastal towns (compare von Richthofen (2015)). The coastal towns themselves witnessed a radical transition, as affluent families moved out into more luxurious neighbourhoods as studied by Scholz (1990) and more recently by Margraff and Scharendorf (2017). Von Richthofen and Langer (2015) have shown that urbanisation has exhausted more than 80% of the available land in the main districts of Muscat Capital Area. 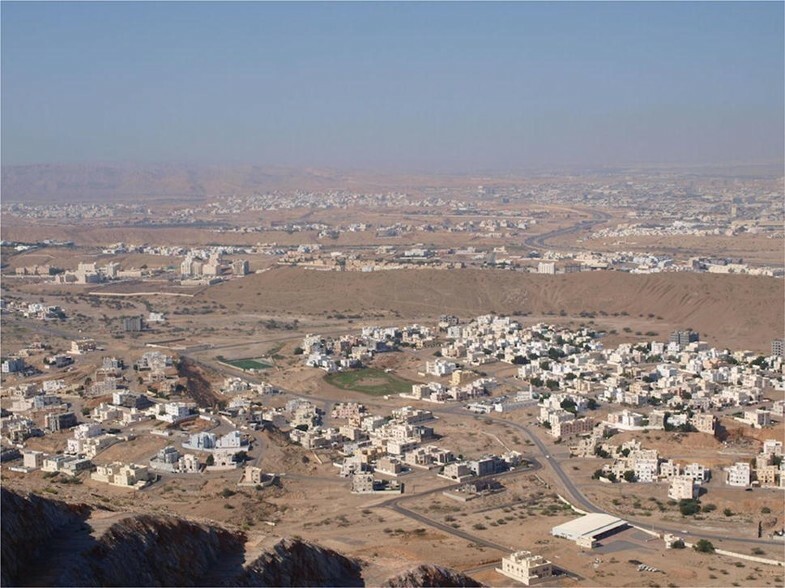 ‘Urban Sustainability’ in Oman as in other Gulf countries has been turned into a political instrument as argued by Cummings and von Richthofen (2017). To regulate housing for a growing population and to manage spatial resources the Omani government installed a particular land-allocation process by lottery in the 1980s granting every Omani citizen, first male and since 2003 female, the right to enter this lottery and eventually receive a plot (Ministry of housing Oman, 2009). The lottery system has been criticised by Al Gharibi (2014) and Nebel and von Richthofen (2016) as leading to ‘unsustainable’ urban sprawl requiring car-based mobility and high use of energy, material and spatial resources. The absence of a land management system and taxes further aggravates the situation and encourages land-grabbing and land-speculation. Since plots are in short demand and the list of applicants is getting longer, the government allocates plots in regions further away from established economic centres. As a rule, applicants can only indicate preferred areas of future residence, based on their current place of work with no guarantee of actually receiving a plot there. The ministry of housing is careful not to reveal the dates and places of upcoming land-allocation areas in order to minimize land speculation. Applicants wait up to three years for a plot and are only entitled to one draw (Times of Oman: “Oman citizens call for greater transparency in land grant announcements 2015). The ministry of housing zones large districts of 2000 and more plots. These plots form a pool for the lottery system before the planning process has been completed and any infrastructure such as asphalted roads or electricity has been installed as argued by Al Gharibi (2014). Technically, the allocated plot remains state property and the citizens are granted a right to usufruct their plot, similar to the Anglo-Saxon land lease. The governmental land-allocation process by lottery is very expensive across Oman, see Nebel and Salcedo (2015). The government plans the districts, conducts the lottery system and eventually deploys the facilities, road, energy, water and waste infrastructure; Al Shueili (2015). Fees for land-allocation to be paid by the applicants are minimal. In absence of land taxation, the government does not receive any direct economic returns from the allocation process as studied by von Richthofen and Scholz (2013). This process has been studied in comparison between Oman and neighboring Saudi Arabia by Shouman (2017) who links the hoarding of land to regime survival strategies in the Gulf. In an earlier work, we showed that there must be severe doubts about the economic support aspect as it seems that the current lottery, without additional measures, fuels private land speculation, see Heim et al. (2018). Omanis define themselves by tribal affiliation which is often discernible by the family name. The Omani population consists of 57 tribes (Miles 1919; Scholz 1990). Each tribe has a historic settlement area. Wilkinson (1977) links the Aflāj (traditional irrigation system) of Oman to tribal settlement patterns. He studied the system of water organisation that used to structure social bonds, enable agriculture and determine urban space. It formed a social and economic contract of tribes and clans in the past. His central argument is that a tribally organised population running a collective irrigation system cannot emerge under a centralised state. Although water and agriculture are not prominent aspects of modern urban life in Oman, the social bonds remain and we can see parallels of a modern Omani population with strong tribal roots undermining a centralised land allocation system. The editors Lavergne and Dumortier (2002) recollected many scholars on Oman [amongst them geographers Fred Scholz (1990) and Belgacem Mokhtar (2013)] to depict the modern Oman identity rooted in its imperial past, Ibadi culture and emerging from the Omani Renaissance post 1970. Their work helped to contextualise the nation building process of which the present land-allocation lottery system is a key aspect. The imprints of tribal settlement patterns across what is now Muscat Capital Area have been studied by (von Richthofen 2018) and form the base of the present urban fabric. Tribal leaders voice their opinion on economic and political matters. The early years of modern Oman were characterized by the tribal uprising and civil war in Jebel Akhdar and Dhofar. (Valeri 2013) describes how tribal bonds continue to dictate political and economic aspects of civil society in Oman and how the Sultan ‘domesticated’ the local elites by granting them ministerial positions and other privileges. Marriages are often arranged to forge tribal alliances, businesses run by clan members and official positions strategically placed to appease tribal tension. Not surprisingly, the tribal heritage has a strong impact on the social life in Oman. Since home-ownership is a decisive moment in every Omani’s fortune and future, it is, therefore, possible to think of tribal affiliations as the main driver for settlement decisions. Since the tribal affiliation is a historic construction linked to the Omani citizens by their name, this tribal affiliation does not vanish or change with the re-settlement in new residential neighborhoods. In comparing land allocation and speculation in Oman to Saudi Arabia Shouman (2017) goes even further. He argues that “Land speculation, the impact [of land-allocation processes] on the housing market and the citizens’ ability to afford them” are tightly interwoven in Oman as in Saudi Arabia; Shouman (2017, p 3). He further argues that so-called ‘White Land’—undeveloped urban land that is temporarily withheld from the market to increase land prices—is often granted to tribal leaders, see Shouman (2017, p 125). The following conclusion for the case of Oman corresponds to the motivation of the agents developed in our earlier study (see Heim et al. 2018): “The purported main causes of White Land in Oman are three: 1- Omani citizens residing on or using state land without having a legitimate right to do so. 2- Gulf Cooperation Council (GCC) citizens owning a lot of land in Oman and not developing it. 3- Some Omani elites owning White Land and not developing it.” Shouman (2017, p 126). Since we have demonstrated the spatial economic consequences in our previous model it is now time to investigate the socio-economic drivers. Belgacem (2011) describes how the socio-economic changes induced by the oil-production have impacted the form, function and structure of urban spaces in Oman. He describes a new spatial mobility of households evident in the purchasing power on building lands and houses. He describes “a dynamism of a parallel land market lets foretell a segregationist division of the inhabited areas or in the currently urbanizing spaces” Belgacem (2011). He illustrates this idea with a ‘heat-map’ of real estate price-distribution for Muscat Capital Area taken from real estate advertisements of 2010 as an indicator of spatial fragmentation and polarisation. Belgacem’s weak source data can only offer a coarse snapshot of social and spatial distribution in Muscat Capital Area. Our agent-based model helps to investigate two key aspects that emerge from the research literature on urbanisation in Oman: (A) Identifying spatial distribution in modern Muscat Capital Area related to tribal motivations in parallel to the historic ones as described by Wilkinson (1977) that undermine central state efforts of controlled land allocation by lottery. (B) Offering a mathematical model to explain the fine-grain motivations of each agent and to demonstrate the emergent phenomena that are congruent with site observation. 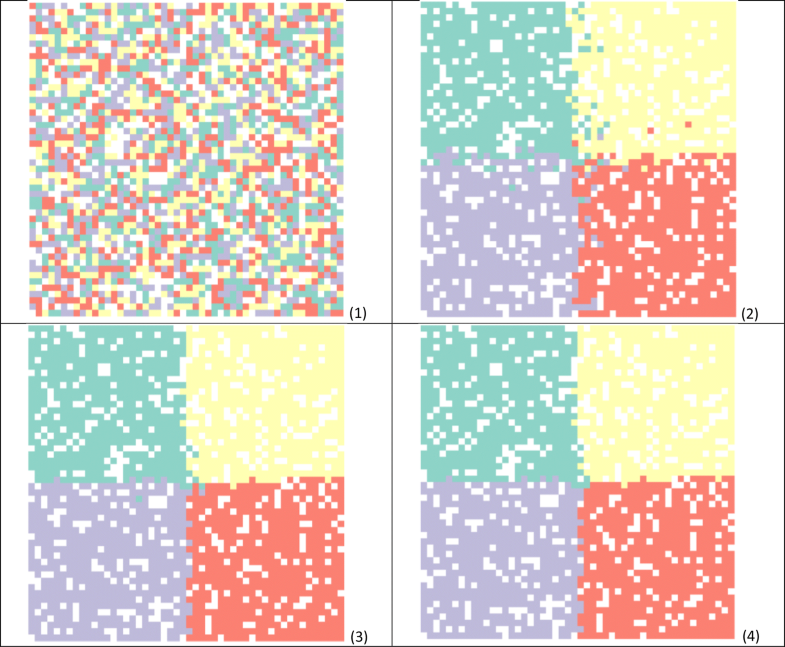 The spatial aggregation of members of a similar tribe will thus be called clan-formation. If Omanis in urban and rural areas choose to regroup their clan members by arranging plots of land in the vicinity of the tribe members, could the governmental land-allocation system by lottery really counter this effect? Is clan-formation an overlooked aspect and a hindrance to equal access to settlement resources? In order to answer the question on the influence of tribal behaviour on the land-allocation process, we decided to expand a previous mathematical agent-based land-allocation model developed by the authors (Heim et al. 2018). This article—as the previous one (Heim et al. 2018)—ignored the more complex demographic composition of Oman with multiple ethnicities and migrant workers and abstracts the model solely on the population group that is included in the state welfare program, namely Omani citizens. This model consisted of a finite number of agents reflecting the range of behavioral choices within the residential market and rules for the agents to either keep, develop or sell their properties. The lottery system is said to be ‘fair’ to all Omani citizens as it allocates a plot to each applicant. It is also said to be ‘efficient’ both in the sense that all applicants get a plot and that these plots are then developed rapidly by the applicants. The study concludes that the lottery system fuels a shadow market of land speculation, excluding those with low income from home ownership, and that plot development plateaus at a completion rate dependent on the level of governmental infrastructure provision. Unless the government applies both incentives for land development and taxation for land speculation, the system cannot be said to be ‘fair’ nor ‘efficient’. On the contrary, neither part of the intended beneficiaries nor the government itself profits from this process. Finally, the lottery system is said to spatially mix applicants of different tribal groups and undermine clan-formation in residential neighborhoods thereby creating a modern mixed Omani society, see Miller (1997). The present paper expands on the previous agent-based simulation to investigate whether this is actually true. Following this study question the remainder is structured as follows: “Modelling clan-formation in residential settlements in Oman” section introduces the mathematical model and three scenarios that illustrate different ways of how conglomerations of members of tribes may take place: (i) swap/purchase/sale of land between two agents, and (ii) between three agents, and with regards to a steering force. In “Discussion of the model results” section we see that all describe scenarios lead a randomized initial mixture of the involved clans to a situation where large to huge sub-areas are occupied by one and the same clan. Hence, although designed with the best intentions, the lottery system lacks in all essential parts if only moderate coordinated efforts are made to bring tribes together. Finally, “Conclusions” section gives a conclusion. As indicated, our model is based on the agent-based cellular automata studied in Heim et al. (2018). There, plots of land are discussed that consist of a combination of roads, and a combination of parcels for business houses and for family houses. Parcels/houses are uniquely associated with streets. Agents (owners of parcels) can be classified according to 3 dimensions: their sales strategy (“keep” vs. “sell”), their development strategy (“built up” vs “don’t build up”) and the urgency to implement them (sell/build: “now” vs. “later”), cf. Table 1 in Heim et al. (2018). Some of these agents just want to build houses for their families, others want to reduce building cost or intend to make business with selling parcels (Seller type) or with well-timed and available houses, whereas others, like Accumulators, intend to gather a number of connected parcels to build larger resorts. The simulations are initiated by providing a certain distribution of these agent types that are randomly dispersed over the plot such that all parcels are covered. Strategy 1: Swapping of parcels between two agents of different tribes with the intention to move into a neighborhood that is occupied by more members of the same clan i.e. the surrounding 24 parcels as discussed above. This strategy is purely local and does not involve any communication on a global level. Strategy 2: Each clan decides to have a dedicated center, e.g. in our case with four tribes each chooses separate corners of the quadratic plot. Using swapping of parcels between two agents each agent tries to get closer to their respective tribe center. I.e., that the Euclidean distance between the center of the previous parcel and the center of new parcel towards the corresponding corner is reduced. Whereas the earlier scenario is local in the sense that each agent tries to maximize their neighborhood, this scenario considers the effects of agreements or tribal members that impose a somewhat binding global strategy on each agent. 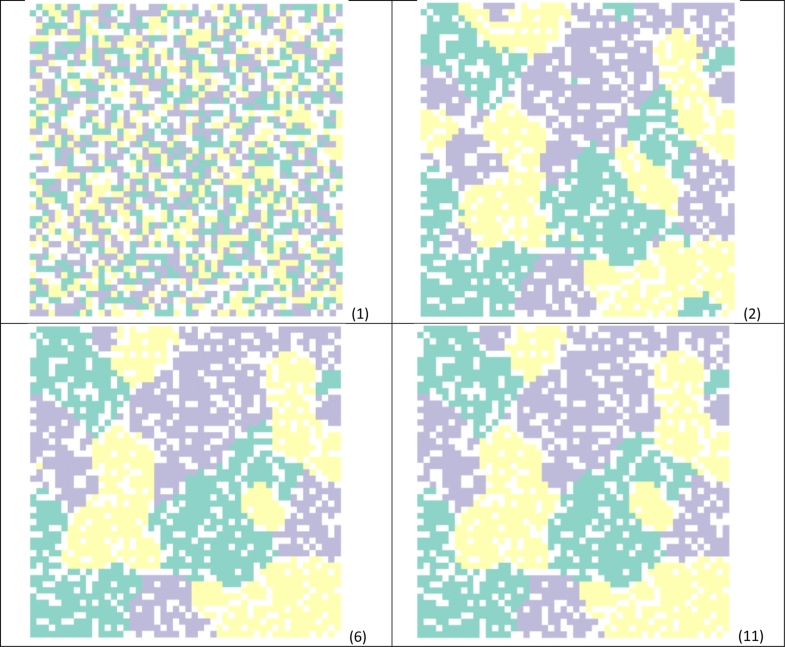 To understand how much effort is needed to counter the positive intention of the lottery to spatially mix the different tribes, we implemented as examples the following two scenarios. Scenario 1: We use agent strategy 1 and distribute four clans in a 1:1:1:1 ratio randomly over the plot. Moreover, we assumed, in favor of the spatial mixing, that the fourth tribe (white) does not follow the idea of forming connected settlement blocks of its members and thus hinders the attempts of the remaining tribes. Scenario 2: We use agent strategy 2 and distribute five clans in a 1:1:1:1:1 ratio. As before the last tribe stays at their given parcel. Repeat these steps until there are no swaps at a phase (then a stationary situation is achieved). Note that the situation may occur that—especially at tribe area boundaries—it may be mutually better for two agents to continuously swap their parcels. In these instances, the program terminates if only this type of swaps occurs. Let us start with scenario 1: The results of our 68th Monte Carlo simulation run on a 50 × 50 parcel with two thousand five hundred agents of this scenario are shown in Fig. 1. We see that in this case, the simulation terminates after 11 phases towards a stationary state where no further exchanges/swaps of parcels take place. For this specific run Fig. 2 provides two illustrative statistics on the number of parcel swaps per phase, see Fig. 2a, and the number of owners/agents per amount of swap, see Fig. 2b. We clearly see that the stationary state is obtained rather fast and with not too many swaps of parcels for each individual agent. the percentage of the 24 surrounding parcels belonging to the same clan, averaged for all agents and on a per clan basis. the total number of occurred swaps. min/mode/median/mean/max number of swaps for a single agent. These statistics clearly indicate that a good level of tribe proximity can be achieved by those tribes whose members aim for this and also that it is not really hard to do so. In particular, the distribution of the swaps per agent has positive skewness (is right-skewed). Of course, under the assumptions that all tribe members are actively engaged in a swap if necessary and that there are enough partners for swapping parcels. The tribe proximity of the tribe 5 which is not engaged in swapping is 0.199 (with a standard deviation of 0.009). Again, we see that an extremely good level of tribe proximity can be achieved very fast and by means of a little bit higher flexibility of the involved agents in terms of the numbers of swaps they may have to undergo. Interestingly, the skewness now is negative (left-skewed) indicating again the more intensive swapping actions of the individual agents compared to the first scenario (Fig. 5). Certainly, scenario 2 yields as well a clear separation of the tribes which is even more pronounced as that in scenario 1. This is not surprising as this scenario is based on a globally optimizing strategy. Though, such an invisible or visible hand of the global optimizer may in reality soon attract the attention of officials. As stated by Shouman (2017, p 127) Omani officials are well aware of so-called ‘White Land’ and ingenious strategies by their citizens to stretch the original intent of the land-allocation process by lottery. The article studies the emergent phenomenon of clan formation within the specific land-allocation system of Oman with a new mathematical and computational approach of agent-based modelling. The new method (clan formation exemplified as agent-based model) and findings (simulated agents and real-world behaviour) yield scientific discoveries that can help to mitigate some of the negative effects associated with the current land allocation system. The article does not claim to present the land-allocation system in Oman as an unknown problem nor does it recommend solutions, but offers a new view onto it through agent-based modelling that allows, for the first time, to quantify emergent phenomena such as clan formation. The mathematical model validates previous research findings of the authors and other researchers in the field of urbanisation in Oman (compare Scholz 1990; Belgacem, 2011; Al Gharibi, 2014; Benkari 2017; Shouman 2017). The previous agent-based model by Heim et al. (2018) revealed spatial-economic inequalities. This study extends the previous model to include socio-economic drivers of land-settlement such as tribal affiliation and clan-formation. Both scenarios developed with the extended agent-based model reveal that clan-formation is inevitable under the current system. A trade-off can be observed between social mix or segregation within clans and efficient land-allocation to clan members. Spatial mixing, as the process of clan-formation, is further constrained by the urgency of individuals to actually settle down, build a home and start a family (compare Scholz 1990; Belgacem 2011; Al Gharibi 2014; Benkari 2017; Shouman 2017). This life-changing decision blocks the mobility of a plot-owner for a long time. For the model, this means that once the initial plots have been settled, there seem to be not enough matching opportunities to create a competitive market. Thus, the following phases cannot accommodate trades motivated by tribal affiliation explicitly, yet also not exclude them totally. The study suggests that Oman is closer to the metaphorical ‘salad bowl’ described by Belgacem (2011) as ‘segregationist division’, where tribal groups might get relocated but not dissolved, than the ‘melting pot’. Incidentally, the land-allocation system strengthens the tribal power on a local level and forms a third aspect contrary to the intended purposes of the land-allocation system a striking parallel to Wilkinson (1977) central thesis that a “tribally organised population running a collective irrigation (and spatial distribution) system cannot emerge under a centralised state” (additions by the authors). Taking limitless mobility of the clan members into account, the simulation tests all desired properties, which would require excessive coordination between clans and individuals in real life. Clan-formation will thus never reach absolute states as described by the model, but gradually slows down, a further indication why the process is hard to back by empirical data, but is a recurring subject among younger Omanis that suffer from the impossibility to access the real-estate market. The simulation results confirm that emergent urban phenomena such as partial settlement, land speculation and spatial mobility can be linked to. Our agent-based model helps to investigate two key aspects in particular: it relates spatial distribution in modern Muscat Capital Area to tribal motivations that threaten to undermine central state efforts of controlled land allocation by lottery and explains, for the first time, the fine-grain motivations of each agent and to demonstrate the emergent phenomena that are congruent with site observation. In conclusion, we can say that tribal affiliation strongly influences the current land-allocation process in Oman. The model shows that clan-formation has (i) social, (ii) spatial, (iii) economic and (iv) political consequences. The original intent of the land-allocation by lottery (i) in support of a modern nation-building, (ii) sustainable allocation of spatial resources, (iii) egalitarian welfare system and (iv) as consolidator of the political status quo does not completely match. Given these multi-dimensional threats to the original intentions of the land-allocation system by lottery, reforms need to be adopted soon. We see the inclusion of tribal motivations into future governance of land-allocation as key to sustainable urban development in tribal societies like Oman. Such a governance system would embrace tribal spatial mobility and affiliation, create necessary clan-clusters on a micro-scale of neighbourhoods while ensuring a fair and even access of all citizens to urban facilities on the larger municipal and regional level. The present agent-based model can be used to develop such a new governance approach. Monte Carlo simulation is a technique used to study how a model responds to randomly generated inputs. No additional data and material is available for this research. There was no funding provided for this research.